Venez vous détendre dans le magnifique Moultonborough et voir pourquoi les gens pensent que la région des lacs du NH est l'un des plus beaux endroits dans le monde. Cette maison est dans une rue calme, mais facilement accessible avec 100 pieds de façade sur le lac Winnipesaukee. Ceci est un site de vacances en famille! Sur place, vous trouverez une plage commune (partagée uniquement avec le propriétaire et totalement privée du lundi au vendredi), un ponton flottant pour la baignade et une terrasse en brique surplombant la plage et le lac réservés au locataire. La plage est de sable fin et les enfants. En outre, vous serez en mesure d'accoster à un 30-pieds bateau sur notre grande facilement accessible, dock, permanente. Vous aurez l'utilisation d'un canot, kayak et voilier; location de bateau à moteur sont à proximité. Le gîte dispose d'une grande véranda-in qui est parfait pour se détendre, manger ou divertissant. La cuisine est entièrement applianced, y compris un gril à gaz juste devant la porte. WiFi et la télévision par câble sont inclus. Nous allons strictement respecter pour avoir un maximum de 6 personnes qui dorment dans ce chalet. Pas d'animaux, s'il vous plaît. Ne pas fumer sur la propriété. Beaucoup de choses disponibles sur demande, y compris (sans toutefois s'y limiter) des glacières, des chaises de plage et divers articles pour des vacances à la plage et en bateau. Nous pouvons également fournir un jeu de cartes à jouer. A great location with wonderful lake toys, a beach, swimming raft, fire pit, and dock! Marie and Jerry are fantastic hosts and even better people. Their place has great lake toys like a canoe, kayak, paddle board, fire pit, private beach & swimming raft, and a dock for our rental boat. The convenience of having boat gas so close was great. The sunsets were great and the water ever better. We spent a lot of time in the Adirondack chairs just enjoying a libation and listening to the loons. Thanks for a great stay. It's wonderful to hear that you enjoyed your stay! Thank you so much, we look forward to seeing you again! Unwind, relax and enjoy your family! We just returned from our week at the Mayotte's cottage. It was the perfect way to relax and unwind. The owners were very responsive to questions prior to our arrival. They were there to greet us once we arrived and were helpful in making suggestions on what to do in the area. The master bedroom is roomy and has a washer/dryer available for the renter's use. The two other bedrooms are very small, each with two twin beds, a closet and a dresser, but, seriously, who spends time in their room when on vacation? The living room was comfortable. The screened in porch was perfect for eating breakfast and dinner. The kitchen was well equipped with all of the essentials you need for the week. There is no air conditioning, but we never missed it since the lake provided a wonderful breeze for sleeping. There is a private dock/patio with a fire pit provided for the exclusive use of renters. Enjoying your morning coffee overlooking the lake never gets old! The owners provided "water toys" to help us enjoy the lake. In addition, Marie and Jerry took us for a 1 1/2 hour ride on their boat to show us the lake. The road that the cottage is on is a dead end dirt road. It contributed to the "cabin" feel and provided a very safe environment for our 2 year old grandson. There is a grocery store just two miles from the cottage. Moultonborough is the perfect central location for enjoying the area. It was an easy drive to Meredith, North Conway and Lake Squam. We hope to return again next summer. We REALLY enjoyed our time in the cottage! It was a great week of relaxing family time while making fun memories! Marie and Gerry could not have been nicer or more helpful and answered all questions prior to arrival and while staying in the cottage. The kitchen was very well stocked and had everything we needed. It was great to have access to all the boats (kayak, sailboat, canoe) and we used them a lot during the week. The washer and dryer was also nice! The cottage was very clean. We enjoyed the fire pit on the patio overlooking the lake on several nights, and had many dinners in the sun porch using the grill. We would definitely recommend the cottage to friends and family! Thanks so much for taking the time to write a review! We're always thrilled when someone has a good time! Thank you again, and hope to have the chance to host you or friends in the future. Get busy or relax at Lake Winni. Our hosts went out of their way to make us welcome. We chose this property because of the dock where we could keep our 21' Sailboat. Also, the location is sheltered from large waves that can be a problem at other locations on the big lake. Jerry took us in his boat to check out the nearby boat launch. This saved us a lot of time. The cottage is charming and welcoming. Our first few days were cold and rainy. The electric fireplace took off the chill. We had a good view of the water from the couch and small table where we ate. After the weather cleared, we enjoyed many things. For relaxing, I sat on the swing, which is really a converted ski lift chair. The we spent time sitting with family on the small patio, overlooking the private beach, with an expansive view of the lake. For activities, the swimming was great. We tried the Versa board and sailed our boat. Overall, what made this property good for us was the location. It is near the Long Island boat launch, and sheltered from rough water. The cottage is small but perfect for us as a party of 3. We appreciate you taking the time to post this! We enjoy taking care of our guests and are thrilled that you had a good time. We had a wonderful week at "The Cottage" as we affectionately called it! We immediately felt relaxed and at home when we arrived. If you are looking for a place just to get away from it all for a bit, this place is it! We used the kayaks, and paddleboards every morning and enjoyed the sunsets on the beach every night. Our 9 year old son even caught his first fish right off the dock. A truly memorable experience and a truly memorable place! Thanks so much for taking the time to write this review. 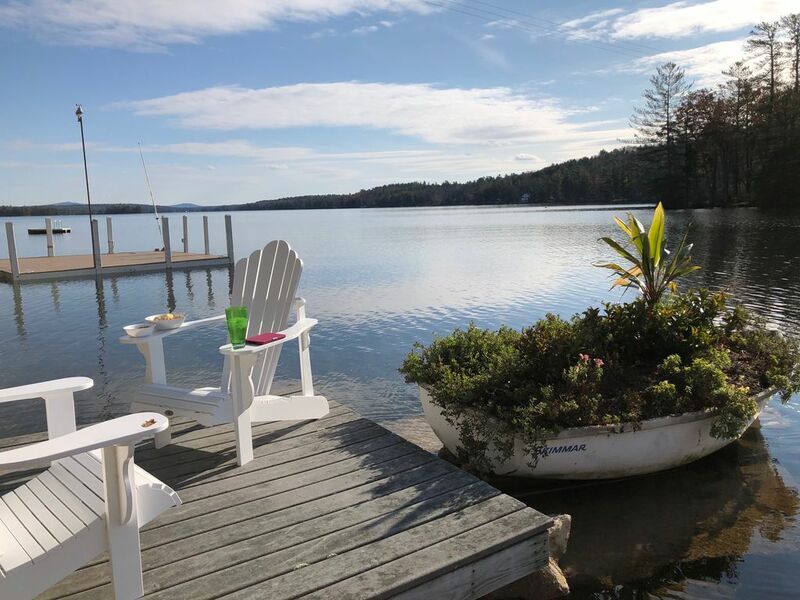 We love Lake Winnipesaukee and we're so glad you had a lovely vacation! Our first family trip to Lake Winnipesaukee and our stay was AMAZING! The Mayottes are wonderful to work with. Very friendly, accommodating and so helpful with information from docking our boat to accessing the internet. The description was accurate and the place was clean and well maintained and stocked with all the kitchen items you could possibly need, including BBQ tools. The screened in porch was perfect place to eat for our grill nights. Easy access to water and sandy beach for swimming, borrowing the Versa board, Kayak and Canoe as well as the dock. We thoroughly enjoyed our stay and would recommend this Perfect Cottage! Thank you so much for taking the time to submit a review! We love Lake Winnipesaukee and we're happy you had a great time! Situé au cœur de la belle région des lacs de NH, votre séjour dans ce confortable chalet en front de mer signifie que vous aurez un accès facile à tout ce que la région a à offrir. Profitez de la natation, la navigation de plaisance, ou traîner sur la plage; tout en restant facilement accessible en voiture des attractions telles que Castle in the Clouds, des concerts à Meadowbrook, le M / S Mount Washington et bien d’autres encore. Les White Mountains de NH se trouvent également à proximité. C'est le paradis des vacanciers! Rental period is normally Saturday to Saturday. Check in is no earlier than 3 p.m. and check out is no later than 10 a.m. Non-refundable deposit of $700 required with initial reservation. Upon arrival, the deposit converts to a refundable security deposit. Please call or email regarding Memorial Day weekend or Columbus day weekend if calendar shows no weekly rental for that date.